I am a figurative painter from a small village in Sweden. I mainly paint with oil colors, which allows me to recreate skin and clothing on the canvas surface. For about a year I have been working on series called Flood, where I have been combining contemporary colors like neon-yellow, frequently used in visibility jackets, with the poses expressed in European 14th-16th century art. In this series I explore what remains when classic religious paintings and scenes are deprived of their religious content and is dragged into a contemporary setting. Even if you do not immediately associate these poses with their source of origin, which are Catholic altarpieces and icons, I want the beholder to experience a sense of familiarity, because I believe these historic poses are part of our collective memory. Until recently, I worked with larger scenes and environmental settings, but in my current work, I focus on the intimate meeting and the expressions of the faces and hands. Somehow I want to fill a gap left after the religious idol picture, in a (partly) desacralized world, mainly to arise/explore the empathy that the older religious painting was supposed to give rise to. 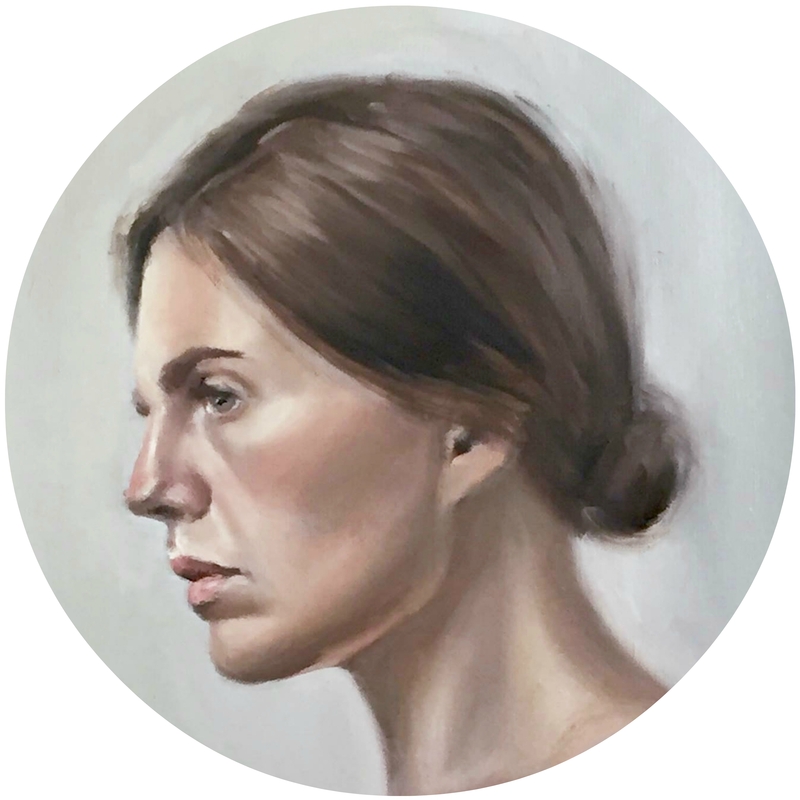 My paintings are not portraits of two people, but instead a portrait of a situation, shared by two individuals, who are not necessarily communicating, and perhaps even strangers to each other. In my process, I invite the models to recreate a scene or a situation. Sometimes I use a camera and other times I paint from life, depending on the models situation (how advanced the pose is and how much time we have got). These last decades, classic and realistic painting has made a comeback to the art scene and there are many artists who explore it. I don’t see myself as a realistic artist, even though I use the same technique, I see myself as an icon painter, working with contemporary motives. I work with oil colors in a traditional manner, using many layers, which is something that allows me to recreate almost any material and give a body to it. For me, it is an adventure to create the illusion of skin and fabrics, in a way that makes us believe in the reality of the images, and that allows the observer to come close to the painting, without shattering the illusion. Because of the fact that a small painting requires the observer to come closer to it, the painting fills the observer’s field of view and the surrounding areas become blurred, enabling these close and intimate encounters between the viewer and the image that I want the viewer to experience.